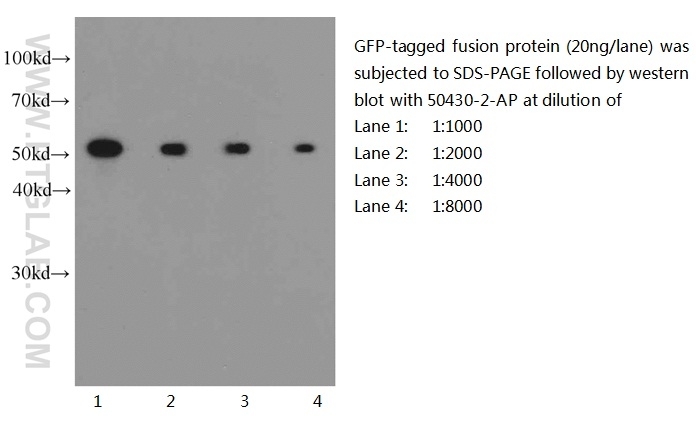 Western blot of eGFP-tagged fusion protein with anti-eGFP-tag (50430-2-AP) at various dilutions. 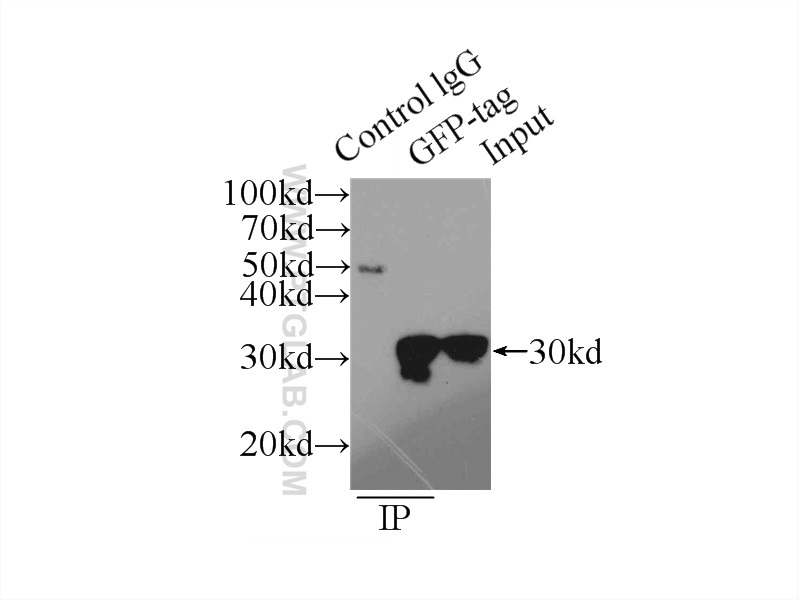 Protein tags are protein or peptide sequences located either on the C- or N- terminal of the target protein, which facilitates one or several of the following characteristics: solubility, detection, purification, localization and expression. Green fluorescence protein(GFP) is a protein composed of 238 amino acid residues(26.9kDa) derived from the Jellyfish Aequorea victoria, which emits green light(emission peak at 509nm) when excited by blue light(excitation peak at 395nm). GFP has become an invaluable tool in cell biology research, since its intrinsic fluorescence can be visualized in living cells. EGFP contains the double-amino-acid substitutions Phe-64 to Leu and Ser-65 to Thr(previously published as GFPmut1; PMID: 8707053). In contrast to wtGFP, EGFP has a single, strong, red-shifted excitation peak at 488nm. GFPmut1 fluoresces 35-fold more intensely than wtGFP when excited at 488nm, due to an increase in its extinction coefficient(Em). 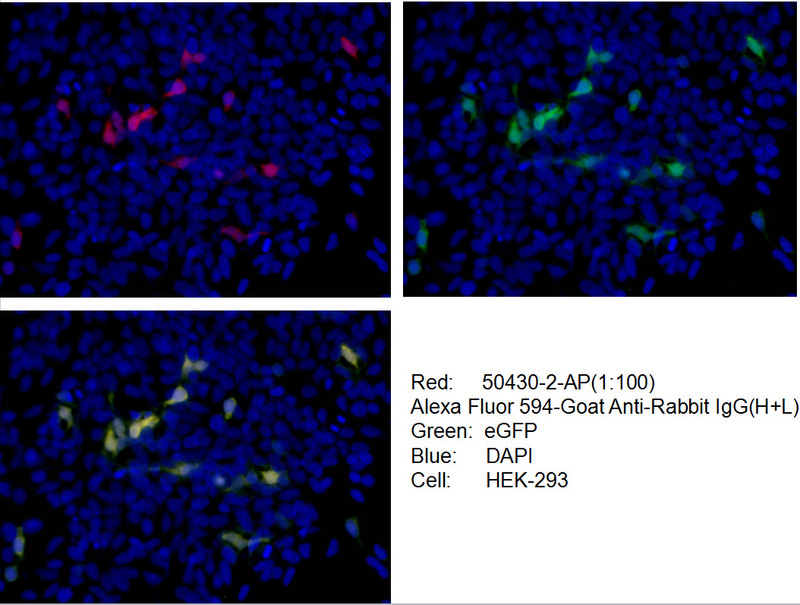 This antibody is a rabbit polyclonal antibody raised against full-length eGFP and reactive against all variants of Aequorea victoria GFP such as S65T-GFP, RS-GFP, YFP, CFP and eGFP. Involvement of SigT and RstA in the differentiation of Streptomyces coelicolor. Evaluation of Toxoplasma gondii as a live vaccine vector in susceptible and resistant hosts. Transgenic Eimeria tenella expressing enhanced yellow fluorescent protein targeted to different cellular compartments stimulated dichotomic immune responses in chickens. Relative quantification of protein-protein interactions using a dual luciferase reporter pull-down assay system. Epimorphin promotes human hepatocellular carcinoma invasion and metastasis through activation of focal adhesion kinase/extracellular signal-regulated kinase/matrix metalloproteinase-9 axis. TAT-mediated oral subunit vaccine against white spot syndrome virus in crayfish.